We got home at 8pm on Thursday the 28th, but its taken me a couple of days to sleep, do laundry and refill my kitchen. Like all our road trips this one at various points made me want to move to more glamorous locales, travel the world and be independently wealthy, and by the end all I wanted was to get home. And be independently wealthy. We got into New Orleans and parked for couple of days, so the mile is approximate. Elaine was sick, so she didn’t get to see much of the city. 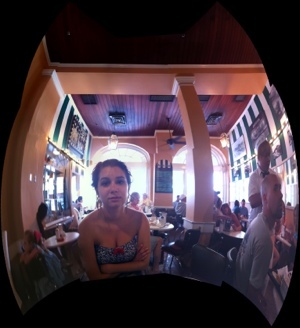 Molly at Cafe du Monde. 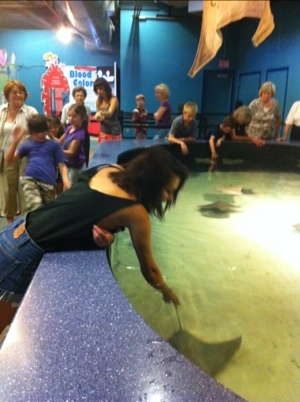 Molly and a stingray at the Audubon Aquarium. We saw a bit of Bourbon Street (Elaine: “Disneyland for alcoholics”) and a bit of the Garden District. Mainly we sweated. A lot. Within 5 minutes of walking outside. And ate some delicious food. New Orleans, at least in June, seems like a great place to go and engage in sedentary pursuits. Eating, reading, drinking, sitting on large porches, etc. All things that I’m really good at, if only it weren’t for the need to occasionally leave the house to make money.